Pecan scab is the most significant disease affecting pecan trees in the US. The scab fungus survives the winter in masses of cells in twigs. During the spring, spores are abundantly produced and infection occurs during periods when rains are frequent. 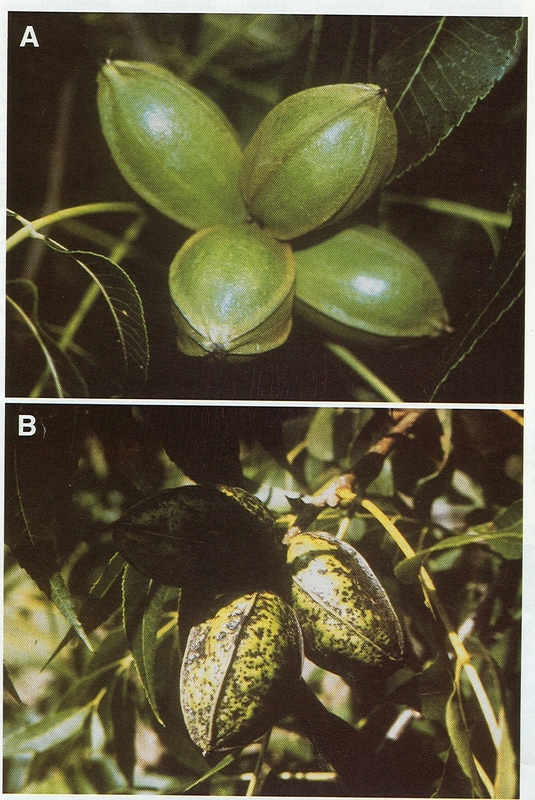 In the absence of spray programs, pecan nut losses approaching 100% can occur. 2013 was a very wet year in the Southeast where most pecans are grown. “The last time Tom Stevenson remembers pecan disease being as bad as this year was in 1994, when a tropical storm stalled over south Georgia and dumped record rainfall in 24 hours – deadly flooding followed it. Though not deadly, record soggy weather dominated the Southeast in many areas this summer. It left pecan orchards vulnerable for a big attack from the crop’s No. 1 enemy. The fungal disease scab scars husks, cuts yield and hurts quality. “We’ve had some wet years before, but not like it has been this summer where it has rained all summer long,” said Stevenson, a south Georgia-based pecan orchard manager. This year, he said, to try and stay ahead of the disease, his orchards got 16 or 17 fungicide sprays, or twice as much as in a normal year, costing $600 per acre this year for fungicide applications. Again, that cost is double what it is typically. Scab claimed about 20 percent of the crop in 2003. But unlike 2003, though, growers have more products and better practices to fight scab, even in bad years, Wells said. And, most importantly, growers have a bigger incentive to fight the disease to max out yields. “A lot of it now is nuts are worth more and growers are more willing to spend money on them,” he said. The U.S. pecan industry has hit a boom in recent years with exports to China now vying for near half of the U.S. production each year. Where once prices fell into a production-driven boom or bust cycle, steady high prices, or $2 to $2.50 per pound, have put orchard management on the front burner for established growers and those looking to expand in it. This entry was posted in Fungicides and tagged fungicides, Pecan Nuts, Pecan Scab, Pecan Trees, Southeast United States by pesticide guy. Bookmark the permalink.